During the reconstruction of Batumi, many interesting structures were built. The alphabet tower is one of them. 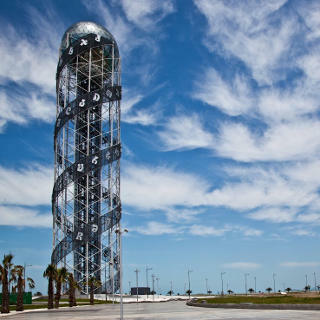 The tower is a tall structure with a glass ball on top. It looks very unusual. Interesting facts about the Alphabet Tower. First, you can go up there and look at Batumi from above. For this you have to ride on two elevators. The entrance fee, costs up to 10 GEL. On the second floor is the main observation deck. On the third floor there is also a small playground, but it’s not so convenient to look from there. Secondly, the shape of the spiral tower is not just. The idea was to make the tower look like a spiral of human DNA. The letters of the Georgian alphabet were put on this spiral. Ie in the design laid the idea that the alphabet is the DNA of the nation.